Cyclists often speak of chain "stretch", as if the side plates of an old chain were pulled out of shape by the repeated stresses of pedaling. This is not actually how chains elongate. The major cause of chain "stretch" is wearing away of the metal where the link pin rotates inside of the bushing (or the "bushing" part of the inside plate) as the chain links flex and straighten as the chain goes onto and off of the sprockets. If you take apart an old, worn-out chain, you can easily see the little notches worn into the sides of the link pins by the inside edges of the bushings, or the formed side plates of a bushingless chain. With bushingless chains, the inside edge of the side plate hole that rubs against the link pin has a smooth radius instead of a sharp corner. This probably contributes to the greater durability of bushingless chains. You can see how the link pin of this unusually badly worn chain has been worn away. Note also how the roller has flopped out of position. The reason the roller flops around is that the "bushing" part of the chain has been eroded away. No doubt the inner surface of the roller has become enlarged as well. Next let's consider how a chain and sprocket wear together. The illustration above shows two formerly identical sprockets of a modern, indexed derailer system, viewed from the right side. These sprockets have short teeth so the chain doesn't have to climb very high to disengage for a shift to a smaller sprocket. As the chain and sprocket wear together, the teeth become sloped at the back, and the rollers ride up on them until the teeth approach a radius that corresponds to the longer pitch of the worn chain. The effective radius (and thus, the effective pitch) of the sprocket has become larger, because the chain is riding higher. There is excess wear on the rollers. They must roll more and press harder because the surface against which they press is not as nearly at a right angle to the direction of tension on the chain. The downward force from the chain at the top of the sprocket is greater and extends farther back around the sprocket with sloped teeth. Further yet around the back of the sprocket, more teeth must push upward to compensate for this downward force. The sprocket also will wear at the height on the teeth which is taking the load. In extreme cases, the chain may lift entirely off the sprocket and skip forward. A new chain on a worn sprocket with sloped teeth will sit nearer the bottom of the gaps between teeth at the top of the sprocket but will be tensioned farther back and also may slip up off the teeth and jump forward unless the chain's return run is held under significant tension. Now let's look into details of how the chain and sprocket work with each other. For now, let's consider the tension from the pulling run of a chain on a rear sprocket. Let's assume that the chain pulls horizontally from the top of the sprocket. From the center of each roller of a new chain to the center of the next is precisely 1/2" (12.7 mm). This dimension is known as the "pitch" of the chain. The diameter of the sprocket is determined by the pitch and the number of teeth. The pitch circle (actually, a polygon with sides 1/2" long) is where the rollers sit if they are all at the same distance from the center of the sprocket. The sprocket teeth are made so that the rear face of each one at the pitch circle is 1/2" from the next. Each roller is free to engage and disengage, despite tension, because the next link ahead of the sprocket is pulling in a straight line away from a tooth which is tilted away from it. The distance between sprocket teeth increases from their bottoms to their tops. The rollers can rise up the backs of the teeth only until the distance between the teeth approaches the pitch of the chain. Even though the profile of the teeth allows them freely to engage and disengage, tension on the chain traps it behind the teeth. The last roller which is about to disengage loses contact with the sprocket tooth while slightly inside the pitch circle. Otherwise, rollers farther back around the sprocket could not be farther inside the pitch circle, as they must be pull less hard -- and they do pull less hard, as we shall see. The video below gives examples of new and old chains running on new and old sprockets, and informs the discussion which follows. Due to the slope of the tooth surface, chain tension is pulling the rollers outward, parallel to the tooth surface, as well as forward. Each roller can roll outward on the tooth surface, though with some internal friction. The roller which is about to disengage from the sprocket is held down by the link behind it, and so forth. Force which cannot be taken up by each roller is passed to the next roller, and so on, back around the sprocket -- in tension from each link pin to the previous one. The sum of all the forces which sprocket teeth apply to the rollers must be in the opposite direction from the chain pull, and in line with the chain. For the force on a new sprocket to be in line with the chain, the first few rollers (fewer with a smaller sprocket) must take most of the load. As mentioned, the first roller pushes the sprocket downward. A few rollers behind the first one, depending on tooth form and sprocket size, may also push the sprocket downward. At some point depending on the tooth form, the changing angle around the sprocket allows rollers to begin pushing upward to cancel the downward push from the first few rollers. Farther back yet, a roller or rollers may be completely disengaged from the backs of the teeth, possibly resting in the valleys between teeth. These rollers can only push inward radially. There is no chain tension at this location beyond what is matched by tension from the return run and/or due to friction. And farther back yet, rollers approaching the return run of chain may be engaging the opposite faces of the teeth, depending on the width of the teeth, tension of the return run and chain wear. The chain should wrap far enough around the sprocket that the return run of the chain can be nearly slack. Common advice is that a chain should wrap at least 1/3 turn around a sprocket. With typical bicycle chain drive, 1/2 turn is more usual. 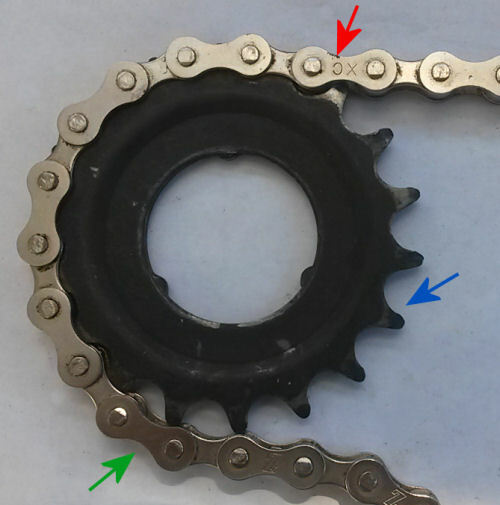 With a worn sprocket, as shown in the video, either the chain's wrap around the sprocket, the tension on the return run, or both, must be greater. The amount of tangential vs. radial force from a roller is very sensitive to where a it sits on the concave, curved surface between the bottom of the valley and the back of the tooth. The chain is constantly finding the position which balances upward and downward forces. With a new chain and sprocket, this balancing act is barely visible, involving radial adjustments of a few hundredths of an inch. Only a very light tension on the return run of chain is necessary to bring it into engagement with the sprocket. This tension is provided by the sprung cage of a rear derailer, or the weight of the return run in a derailerless system. The light tension on the return run subtracts from that of the pulling run and shifts the location where the rollers fall into the gaps away from the return run. The gaps must be deep and wide enough that the links can run free at that location, or the chain will bind. The chain may or may not bear on the front face of the teeth near the return run and pull lightly back on the sprocket. The chain engages a chainwheel differently from a rear sprocket. Engagement with the chainwheel is with the driving run of chain and disengagement, with the lightly-tensioned return run. Nonetheless, the basic form of the chain's travel around the chainwheel is the same. There is one notable difference: the chain engages under tension from over the top of hooked teeth -- if they are hooked -- rather than digging in behind them. Jumping forward of the chain with a worn chainwheel occurs at the lightly-tensioned return run rather than the pulling run, and involves less power loss. A bit of jumping forward of a worn chain is visible even in the video below, with a new chainwheel. The standard way to measure chain wear is with a ruler or steel tape measure. This can be done without removing the chain from the bicycle. The normal technique is to measure a one-foot length, placing an inch mark of the ruler at the side of one link pin, then looking at the corresponding link pin 12 complete links away. On a new, unworn chain, this link pin will also line up exactly with an inch mark. With a worn chain, the link pin will be past the inch mark. For accurate measurement, the chain should be held under some tension -- either on the bicycle, or hanging. Also, use a metal ruler or tape measure. Wood, plastic and cloth all can expand or shrink. Measurement is also possible with a metric ruler -- see below. This technique gives a direct measurement of the wear to the chain, and an indirect measurement of the wear to the sprockets. first, let's look at how to do this with a ruler that measures in inches. If the link pin is less than 1/16" past the mark, all is well. If the link pin is 1/16" past the mark, you should replace the chain, but the sprockets are probably undamaged. If the link pin is 1/8" past the mark, you have left it too long, and the sprockets (at least the favorite ones) will be too badly worn. If you replace a chain at the 1/8" point, without replacing the sprockets, it may run OK and not skip, but the worn sprockets will cause the new chain to wear much faster than it should, until it catches up with the wear state of the sprockets. If the link pin is past the 1/8" mark, a new chain will almost certainly skip on the worn sprockets, especially the smaller ones. In metric measurement, 10 links of a new chain are 25.4 cm, or 15 links, 38.1 cm. If the link pin is up to 25.5 cm or halfway between 38.2 cm and 38.3 cm, all is well. If the link pin is a little bit past 25.5 cm, or approaching 38.3 cm, you should replace the chain, but the sprockets are probably undamaged. If the link pin is approaching 25.7 cm or 38.5 cm, you have left it too long, and the sprockets (at least the favorite ones) will be too badly worn. If you replace a chain at this point, without replacing the sprockets, it may run OK and not skip, but the worn sprockets will cause the new chain to wear much faster than it should, until it catches up with the wear state of the sprockets. More than that, and a new chain will almost certainly skip on the worn sprockets, especially the smaller ones. There are also special tools made to measure chain wear; these are a bit more convenient, though by no means necessary, and most -- except for the Shimano TL-CN40 and TL-CN41 -- are inaccurate because they allow roller play to confound the measurement of link-pin wear. Thanks to Jacob Allen, Osman Isvan, Crispin Miller, Jim Papadopoulos and John Schubert for assistance with this article.